During the election campaign, Narendra Modi said several times that he wished Vallabhbhai Patel had become India’s first Prime Minister. And he promised to build a ‘Statue of Unity’ in Patel’s memory that would be far grander than the Statue of Liberty itself. Mr Modi never spelt out why he admires Patel so much. I suppose it is because the Sardar was a brilliant administrator; because he was sympathetic to business; because he took a hard line on China; and finally, because if Patel had become Prime Minister, there may have never been a Nehru-Gandhi dynasty. In his speeches, Mr Modi also praised other freedom fighters. So far as I can recall, one name he never mentioned was that of Morarji Desai. Like Patel, Desai was a native of Gujarat. Unlike Patel, he did in fact become Prime Minister of India. Born on February 29, 1896, Desai began his working life as a colonial civil servant. Inspired by Mahatma Gandhi, he joined the freedom movement, and spent long periods in jail. After Independence he served as chief minister of the then undivided State of Bombay. Later, he shifted to the Centre, where he held important Cabinet positions, including that of finance minister. 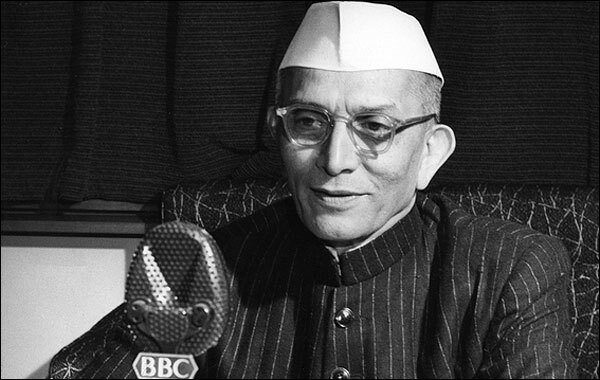 Writing to CD Deshmukh in April 1956, Jawaharlal Nehru remarked that ‘there are very few people whom I respect so much for their rectitude, ability, efficiency, and fairness as Morarji Desai’. Later that year, there was a clash between Hindus and Muslims in Ahmedabad. When the fighting escalated into a full-fledged riot, Desai went on an indefinite fast, which he broke only when the violence had stopped. In April 1960, the Chinese Prime Minister Zhou Enlai came to India, seeking a resolution of the border dispute. He met many senior politicians, including Desai. When Zhou complained that India had given the Dalai Lama refuge, Desai reminded him that Karl Marx himself was given asylum in the United Kingdom. Then, when Zhou asked why the government had permitted protests outside the Chinese embassy, Desai once more underlined the fundamental distinction between dictatorship and democracy. His own effigies, he noted, were burnt in the streets after every Budget he presented in Parliament. On Nehru’s death, Lal Bahadur Shastri became Prime Minister. When Shastri passed away prematurely in 1966, Desai and Indira Gandhi fought a leadership election. Desai lost, then agreed to serve in Mrs Gandhi’s Cabinet. However, the two never got along, personally or ideologically. When Mrs Gandhi took her leftward turn in 1969, Desai was divested of the finance portfolio, and he resigned from the Cabinet. Soon afterwards the Congress split. Desai now went into Opposition, and then, in 1975, was jailed by Mrs Gandhi when the Emergency was proclaimed (along with other opponents of her regime). In January 1977, Mrs Gandhi’s critics were released. On January 19, leaders of the Jana Sangh, the Bharatiya Lok Dal, the Congress (O) and the Socialists met in Desai’s residence. They decided to merge, and form a united ‘Janata Party’. When the new party roundly defeated the Congress in the March elections, Desai became Prime Minister. He stayed in the office for two-and-a-half years. His tenure is not remembered warmly in popular memory, in part because the party (and government) fell apart in petty bickering. This is unfortunate, because in his brief time as Prime Minister, Desai helped restore the credibility of Indian democracy, which had been so grievously damaged during the Emergency. Interviewed on the eve of the 1977 elections, Desai said that if elected, Janata would ‘work for the removal of fear which has enveloped the people’, and would ‘rectify the Constitution’, so as to ‘ensure that [an] Emergency like this can never be imposed’ again. He kept his word. The 44th Amendment, piloted by Desai’s Law Minister Shanti Bhushan, undid the Emergency-era provisions enhancing the Prime Minister’s powers and making him or her immune from judicial scrutiny. Remarkably, given their past differences, Desai was able to get Indira Gandhi herself to vote in favour of the restoration of the Constitution. In person, Desai was somewhat stiff and charmless — which, along with his obsession with nature cure and Prohibition, made him less than beloved of the media and the middle class. Yet he was more human than his public persona suggested. He liked the game of cricket — CK Nayudu was one of his boyhood heroes — and even had a taste for classical music. After Partition, the great vocalist Bade Ghulam Ali Khan was persuaded to migrate to Pakistan. Finding that country inhospitable to his music, the Ustad sought to move back to India. Desai, then chief minister of Bombay State, facilitated his return by allotting him a government apartment to live in. Desai had his flaws, among them a (very Indian) blindness to the faults of his children. Yet his strengths far outweighed his weaknesses. Our first Gujarati Prime Minister was a patriot, a democrat, a modern-minded administrator, a bi-partisan parliamentarian, a lover of classical music, and — not least — a man who would put his own life on the line to safeguard religious harmony.